I have selected 2 ways I want to control my locomotives on the track at the Peachtree City house. One way is radio control using the RCS system with battery power and the second way is using DCC via track power. Both have their advantages and disadvantages and my intent is to install both in all the locomotives so that I can have the best of both worlds. RCS is only good for the locomotives. It cannot hook up to a computer or be controlled via the iPhone or iPad. It cannot create routes for turnout controls and it cannot control the signal lights. What it can do is run on a very dirty track and not care what else is on the track. DCC is an industry standard and I have selected Digitrax for my DCC solution. This is a full control system where I can create blocks on the tracks, control signals, turnouts all via computer or via my iPhone or iPad. The drawback is that you have get the signal through the track to the locomotives. So now that I have selected both I have to get the controls, batteries and other items into the different locomotives. Some are easier than others. I decided to tacks and easy one and a hard one this past weekend. I first worked on the Kalamazoo Toy train Notre Dame locomotive. This is a steam locomotive with a coal car that follows. 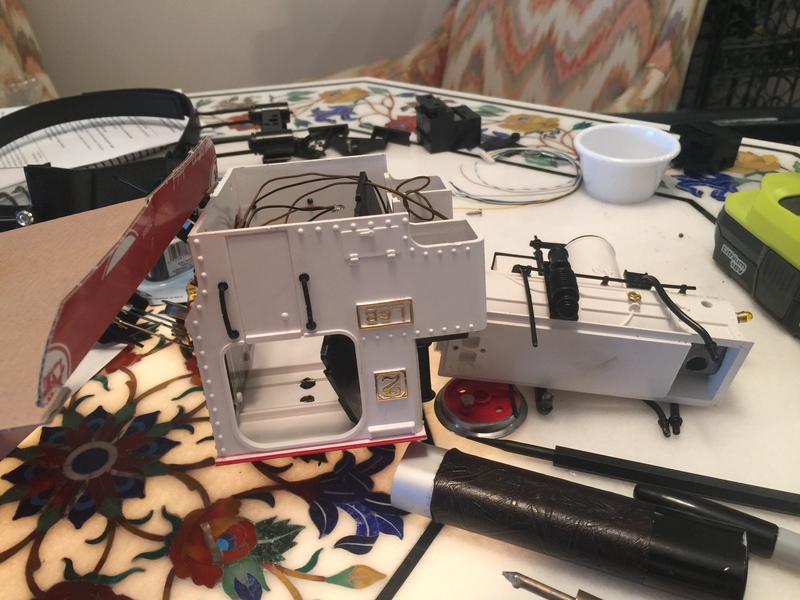 At my first attempt I could not get the locomotive entirely disassembled. The problem was getting the motor box out of the bottom of the locomotive. Eventually I found that one screw secured the back and a bolt for the smoke stack and then the motor box could be pulled out. 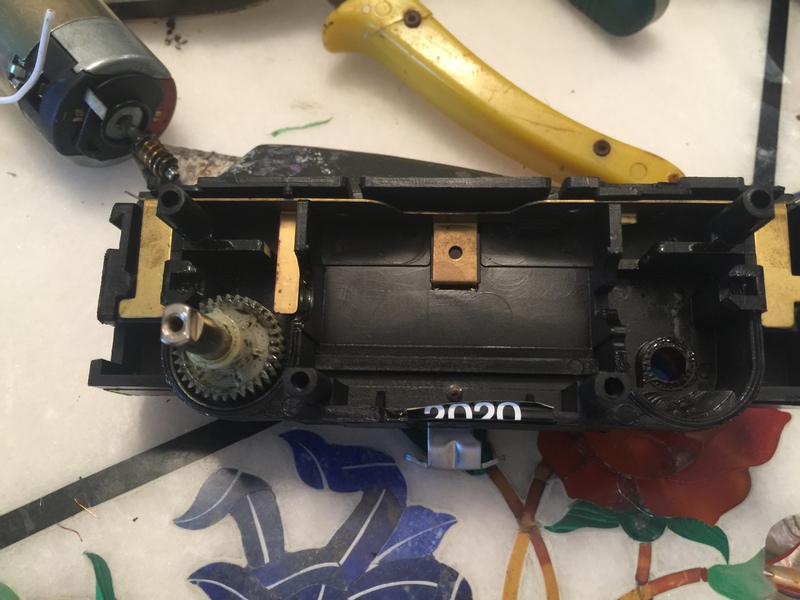 I opened up the motor box and found that they used copper pieces to connect the track pickups to the motor leads. 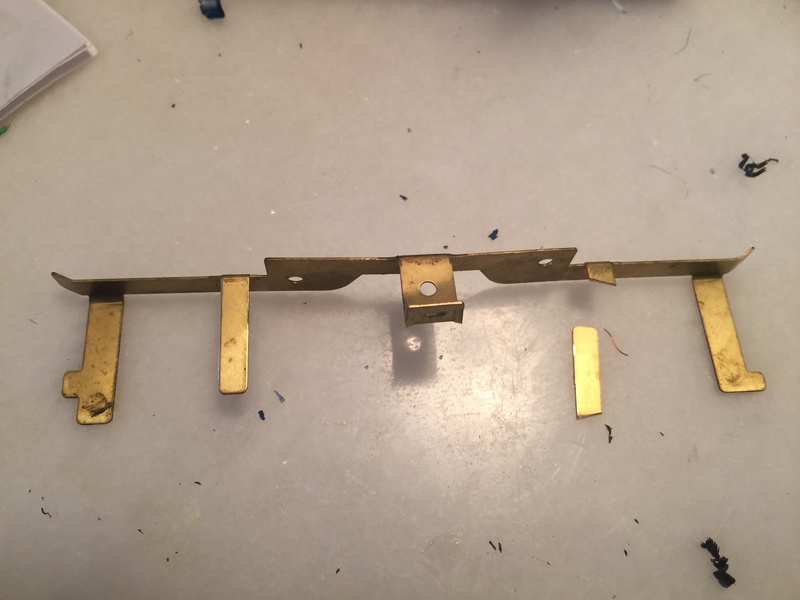 I then cut the copper piece that connected to the motor leads and soldered 2 wires onto the motor leads, drilled a hole in the box and brought the wires out. For the track pickups, there were two contacts already there for the lights and I just attached two more leads coming out. 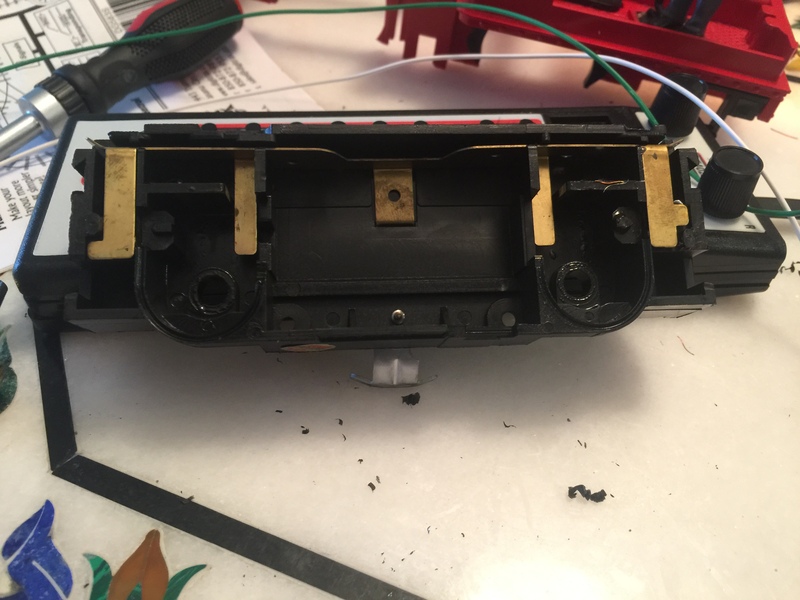 Unfortunately there was not room in the locomotive for the DCC card so I installed the card inside the coal car and ran the 4 leads back to the coal car. 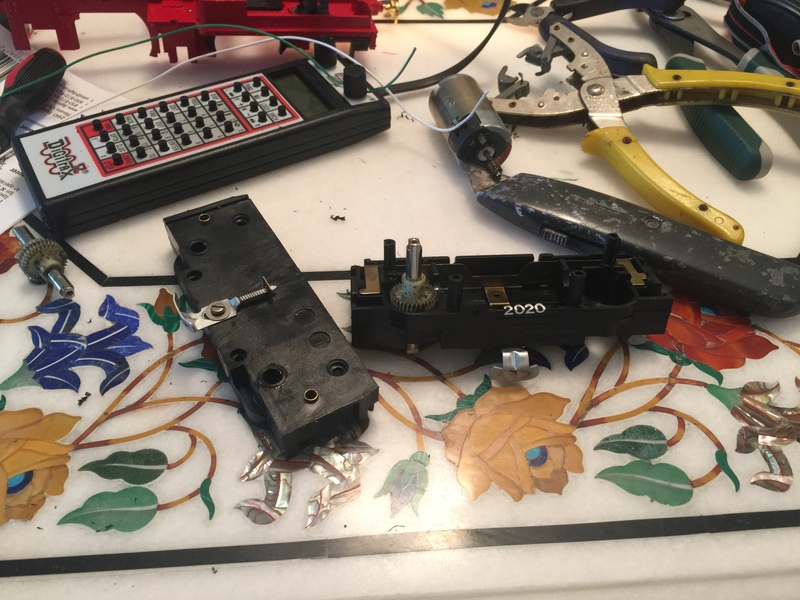 The DCC module only needed the 2 wires from the track pickup and 2 wires for the motor and I now had a DCC controlled locomotive. 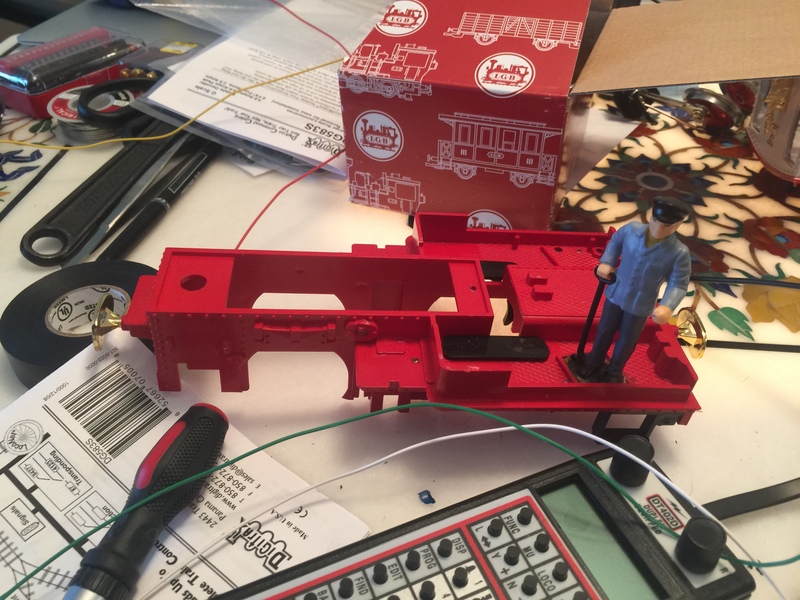 I will need to add batteries, switches, and a sound card into the coal car soon but at least (when the locomotive was reassembled) I had a working DCC locomotive. The circus train was a lot more complex. Typical of the Germans. 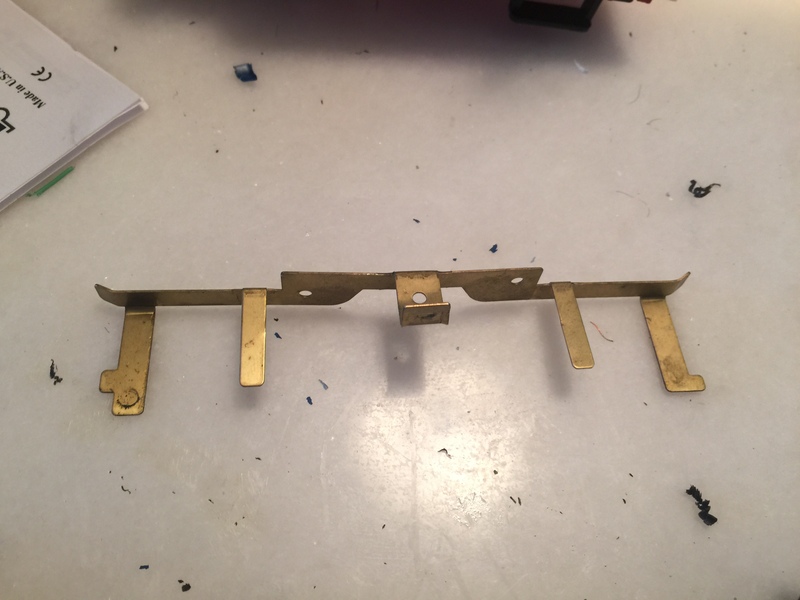 Once I saw how the Kalamzoo Toy Train locomotive motor box came out I used the same technique for the LGN 202 Circus Train Locomotive. Again no room in the locomotive so I need to put the electonics in a different car. This train is different because I also have the powered coal car and a sound car (train sounds) so I have to decide on the layout for everything. 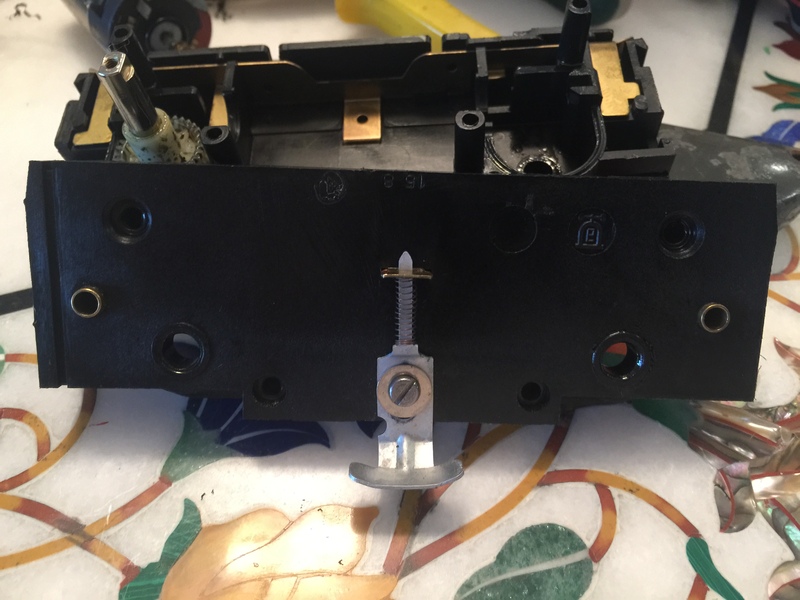 I had some problem isolating the motor from the pickup leads so I will be back to update you on the plan for the LGB Circus Train and how I plan on getting everything set up.